The future grid connection 'Hollandse Kust (zuid)' consists of two connections of 1,400 megawatts (MW) in total. The connections will be operational in respectably 2021 and 2022. 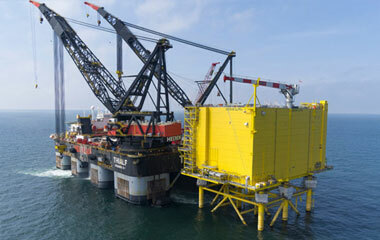 From the platforms there will be a total of four alternating current cables that run to the high-voltage substation De Maasvlakte on the mainland. Onshore they will be connected to the the Randstad 380 kV South Ring.. Hollandse Kust (zuid) Alpha will go into service in 2021 and Hollandse Kust (zuid) Beta in 2022. TenneT has officially been appointed as offshore grid operator in the Netherlands, and will develop -as contribution to the Energy Agreement- at least 3,500 MW of offshore-connections until 2023; all with a standardised concept of 700 MW per connection. Memo on overplanting HKZ and Annex with effective soil resistivity values, November 2018. Please note, this Cigré paper provides further in-depth insight in the technical assumptions behind the calculations on overplanting, for your information. As the inter-array cables of site III will cross with the 220 kV export cables of TenneT, a crossing agreement shall be agreed between the parties. For information purposes, TenneT publishes this model Crossing Agreement. The Crossing Agreement may be subject to any amendments that TenneT may deem necessary. For your information, attached schematic overview of the foreseen route optimisation of TenneT's 220 kV export cables and a memo to explain the considerations leading to this optimisation. Potentially, a Proximity Agreement may be required as well, subject to location-specific circumstances, such as, but not limited to the final lay-out of the Wind Farm itself and its distance to the borders of the Wind Farm's Site. This Proximity Agreement will – where applicable - be based on the same principles as incorporated in the Crossing Agreement, however taking into account the differences between a cable crossing and a situation where cables will be installed in each other's proximity. Presentation by TenneT during the "informatiebijeenkomst over Tender voor de kavels III en IV van Hollandse Kust (zuid)", organised by RVO/EZK, 15 November 2018 in Zwolle. Presentation by TenneT during the RVO/EZK Workshop Offshore Wind Farm Zones in the Netherlands, 23 October 2018. In July 2017 the final reports of the offshore geotechnical survey have been received by TenneT. In this survey about 70 locations were investigated including soil sample analysis and various measurements of the thermal conductivity. One report consists of the results of the offshore (trenched) route and one report consists of the analysis of the two landfall HDD options. The relevant parts of these final reports are available for wind developers preparing for the offshore wind tender HKZ, upon request via netopzee(at)tennet.eu. Memo on scour protection Hollandse Kust Zuid In addition, the report by Deltares on "Scour development and conceptual scour protection layout at HKZ Alpha and Beta" and the report on modelling of flow amplification can be requested by wind developers preparing for the offshore wind tender HKZ via Netopzee(at)tennet.eu. General questions can be submitted to netopzee(at)tennet.eu; please note answers will be published in an anonimised format. TenneT distributes an Offshore Grid Newsletter, with an overview of recent developments regarding the development of the offshore electricity grid, focussing on the interface between TenneT and offshore wind farms in The Netherlands. If you wish to receive this newsletter, please subscribe by sending an e-mail to netopzee(at)tennet.eu. For information: national regulation (Besluit van 23 maart 2016, houdende regels met betrekking tot de schadevergoeding bij niet-beschikbaarheid van het net op zee) and the Ministerial ruling (Regeling schadevergoeding net op zee van 22 maart 2016) on compensation in case of delay and/or unavailability of the offshore grid. By means of the National Energy Agreement, the Dutch government wants to achieve a substantial increase in the share of wind energy in the Netherlands’ energy mix. To increase offshore wind energy capacity, the government has designated three zones in the North Sea for the development of new wind farms. 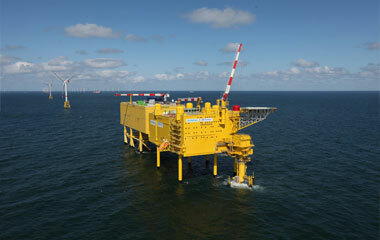 The grid connection of the Borssele offshore wind area will be 1400 megawatts (MW), consisting of two connections each of 700 MW. 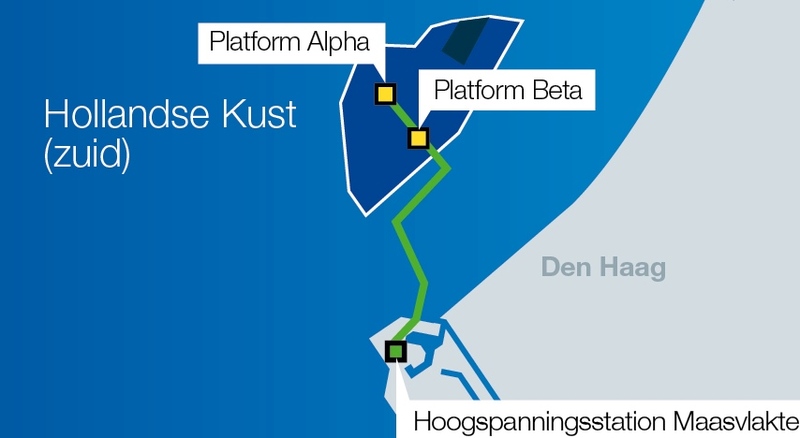 The Borssele grid connection will comprise two platforms that TenneT will build (called Alpha and Beta). The future grid connection 'net op zee Hollandse Kust (noord)' will bring offshore wind energy ashore. It consists of one platform with a capacity of 700 megawatts (MW). It will be connected to the Randstad 380 kV North Ring and will be operational in 2023.